Ravenna’s Mausoleum of Galla Placidia, or Mausoleo di Galla Placidia, is a Christian chapel dating from the fifth century. Once believed to house the tomb of Roman Empress, Galla Placidia, the mausoleum is one of the area’s great hidden treasures and an essential stop for anyone visiting Ravenna. The Mausoleum of Galla Placidia dates back to 430 AD and is one of the oldest structures in Ravenna, although there is some confusion over why it was built. For many years it was thought to have been constructed as a family mausoleum by Galla Placidia, daughter of Emperor Theodosius (393-423 AD), who died in 450 AD after spending much of her life as a powerful political figure. However, modern scholars have dismissed the idea that she was ever entombed in the mausoleum. It is believed she commissioned the structure to serve as an oratory. This proposal is supported by the observation that the structure was originally connected to the narthex of the adjacent Church of Santa Croce, or Holy Cross, which Galla Placidia is known to have built. Within the mausoleum lie three sarcophagi, or stone coffins. The largest was thought to contain Galla Placidia, but in 1577, the contents were accidentally burned. The other two sarcophagi have been variably attributed to Galla's son, Emperor Valentinian III, her brother, Emperor Honorius, and her husband, Emperor Constantius III. Again, there is great uncertainty over the accuracy of these attributions. In 1996, the Mausoleum of Galla Placidia was placed on UNESCO’s World Heritage List along with seven other structures in Ravenna. The building itself is in the western Roman architectural tradition. It is shaped like a Greek cross and measures 40 feet by 30 feet. It has a plain exterior with pilasters meeting in arches and a cupola hidden by a small quadrangular tower. Inside, the walls are lined with restored yellow marble panels and the structure is lit by 14 small windows. Interestingly, rather than being aligned with the axis of chapel, the cross on the vault is pointed towards the east because, due to its position, the chapel does not have the traditional east west alignment. While visitors may be mislead by the rather simple exterior, inside the Mausoleum of Galla Placidia, there are breathtaking early-Byzantine style mosaics adorning the floors, ceilings and walls. 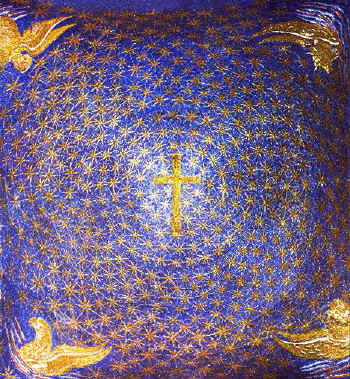 Perhaps most impressive is the vault of the oratory, which has a mosaic depicting the night sky, with more than 800 stars arranged in concentric circles around a golden Latin cross. Cole Porter is said to have been so inspired by it that composed his popular song ‘Night and Day’ while visiting on his honeymoon in the 1920s. 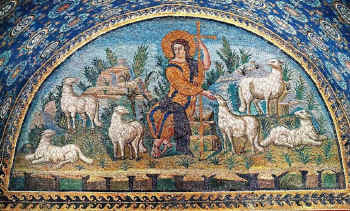 One of the more significant mosaics within the mausoleum depicts Christ as the Good Shepherd tending his flocks. While this was a common image during the Roman period, this particular mosaic shows the Good Shepherd with a golden halo, wearing a royal purple mantle over a golden tunic and holding an imperial staff joined to the Christian cross. Previous images had depicted Christ as a traditional countryman. This mosaic is located over the entrance on the north side. On the south wall, there a mosaic thought to depict martyred Roman deacon, Saint Lawrence, running towards an iron grate that is engulfed in flames. He is holding a cross and a book inscribed with Hebrew text. The Mausoleum of Galla Placidia is only one example of why Ravenna is called the 'mosaic city', so when planning a short trip or vacation to this region, it is worth taking the time to also enjoy its seven other UNESCO World Heritage sites. Ravenna is located about 80 km from Bologna and is well served by direct train services not only from Bologna, but also Faenza, Ferrara, and Rimini. Direct trains take around 1 hour 15 minutes from Bologna, with one-way fares costing €5. The railway station is one mile from the center of town at Piazza Fernini. If coming by car from Bologna, travel east on the A14, or from Ferrara, take the SS16. 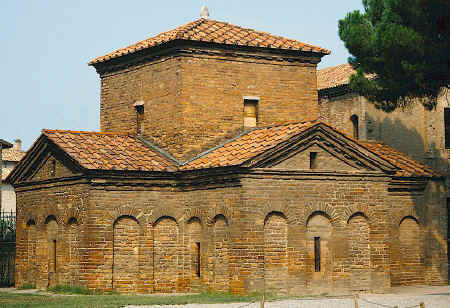 The Mausoleum of Galla Placidia is located in the center of Ravenna. Take a Line 1 bus from the train station to Piazza Baracca, which is 200 m from the mausoleum. There is also a car park in Piazza Baracca, with a fee payable. The Mausoleum of Galla Placidia is open daily from 9 am to 7 pm between 30 March and 30 September and 9 am to 5.30 pm the rest of the year, except 25 December and 1 January when it is closed. Tickets cost €9.50. This is a combined ticket that also allows entrance to Basilica of Sant'Apollinare Nuovo, Neonian Baptistery, Basilica of San Vitale, and Archiepiscopal Museum and Chapel. Note that an extra €2 charge applies to visiting the mausoleum between 1 March and 15 June. 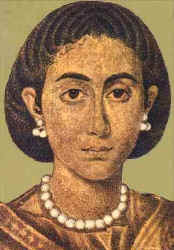 Aelia Galla Placidia was the daughter of the Spanish-born Roman Emperor Theodosius I (Flavius Theodosius), "The Great" (379 – 394 AD) and his second wife Valentina Galla, the daughter of Emperor Valentinian I. She was the younger half-sister to the Emperors Arcadius and Honorius. From 397 AD, she was raised and educated in Rome, in the household of Stilicho the Vandal and his wife Serena. Galla Placidia was taken hostage during the sack of Rome (410 AD) by the Visigoth king, Alaric, and was later married (414 AD) at Narbonne, in Gaul, to his successor Athaulf. Their only son Theodosius died while still a child. Following the assassination of Athaulf (415 AD), the Goths mistreated Galla Placidia but eventually she returned to Rome where she was then forced by her brother to marry Constantius (363 – 421 AD), one of Honorius's generals, in Ravenna (417 AD). By Constantius she became the mother of the emperor Valentinian III and of Justa Grata Honoria. After quarrelling with her brother, Placidia fled to the court of Constantinople (423 AD). She was later restored to power in Rome with the backing of an eastern Roman army. The usurper Johannes was suppressed and her six year old son Valentinian was installed in Rome as Emperor (Oct 23, 425 AD), with Galla Placidia acting as regent. Her influence remained supreme for some time, but was eventually surpassed by that of the military commander Aetius and from about 433 AD his influence displaced that of the Empress Mother who, as a fervent Chalcedonian Christian, from then on devoted herself to works of religious patronage and charity, and built churches and her famous mausoleum in the Church of the Holy Cross, in Ravenna. When her daughter Honoria conspired with the court official Hyacinthus to propose marriage to Attila the Hun, Placidia had to personally intervene to save her daughter’s life when the plot was discovered. Empress Galla Placidia died on the 27th of November, 450 AD, aged sixty-two, in Rome. Her famous tomb in Ravenna housed a life-sized figure of Galla Placidia seated on a throne of cypress-wood that survived several hundred years before being accidentally destroyed in a fire, caused by two children playing with matches. 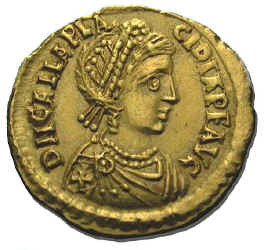 She was commemorated on a gold solidus minted in Ravenna in about 430 AD.